e36 M3: sedan vs coupe: tech specs? Discussion in 'E36 M3 (1995-1999)' started by eawright301, Oct 29, 2008. Can anyone help? Most importantly- suspension component differences (sway bar thicknesses, spring rates, and so on)? Also- interior dimensions? Seating position differences? I'm not trying to get into the ethical side of things here... I realize that a great way to look at things is: "if you want 4 doors, get an m5." However, there are more low-mileage sedans out there than there are coupes, it seems, which may put the sedan buyer at an advantage. The springs are different, but can't tell you exactly how. The spring table is pretty incomprehensible as it includes options like cold weather package and other stuff. The bars may be bigger on the 4 door, because of the higher weight. I have not noticed any real difference in driving position between the 2. The 4 door is slightly heavier. Both are great cars. The 4 door sure does make it easier to get groceries. Ha, grocery shopping in a M3. It's what soccer dads do right? In my neighborhood they all drive mini-vans; very Orwellian I might add. You gotta eat, right? I grocery shop in my 200+HP 325ti, and used to very often in the 88 M5. The cars are virtually identical in all respects. The sedan is an inch taller (53.7" vs 52.6") and about half an inch narrower (66.9" vs 67.3"). They weigh exactly the same, 3175 lbs, and have the same track width (56"), overall length (174.5") and wheelbase (106.7"). I actually have one of each at the moment but if I could only have one, it would be the sedan! They drive identically to each other but the sedan has more useable interior space and a very user friendly backseat. Also, I MUCH prefer the window mechanisms in the sedan! The doors have actual window frames so the windows don't have to drop every time you open the door. It sounds minor but I've had to fix my window regulators/switches in the coupe several times but I've never had to touch the ones in the sedan. I have to think the constant going up and down a half inch every time you open the door puts more wear and tear on them. But no matter what you decide, you'll be making the right choice, the E36 M3 is a great car!! The E36 M3 sedan is a great car and highly sought after by M3 enthusiasts, but that isn't answering your questions. Essentially the suspension underpinnings are identical, the springs are slightly taller but of the same rate, the entire rest of the car is different. it is a true sedan with door frames and a full B pillar. the front seats are the same as the 328i sport package / M3 luxury package and I for one prefer them to the coupes Vader seats, although they don't look as aggressive. The cars do drive differently and the sedan gets the nod here too in my opinion. The body shell itself is stiffer and tighter (having smaller openings) and framed doors. This makes them handle slightly better and provide a more solid feel. Also the sedans get a slightly lower rear end ratio (am remote right now so don't have the actual numbers) so they feel more torque filled under normal driving conditions. Other differences are dashboards and various interior and trunk area trim and dimensions. A very clean E36 M3 sedan with under 75k miles, with a clean history, in a desirable color and with the right options (fold down rear seat) and a 5-speed, it's a name your price car in the enthusiast market right now. That will also make it a relatively inexpensive car to own as it will hold it's value very well. So buy a nice one and enjoy! Has anyone logged a lot of miles in both the Vader seat and in the 328i sport/M3 Lux package seats? Im about 5'9", 160 pounds, and prefer to drive my cars in a lower-slung position with legs relatively straight out. 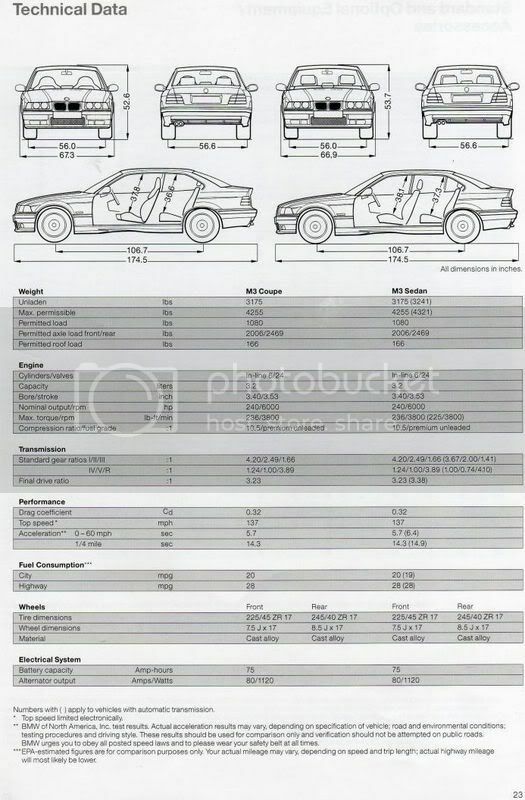 Id be interested to hear opinions on the prospects of long-term comfort in an e36 m3. Which seat is better? For me personally (and if the following sounds familiar to anyone, its probably your opinion on e36 seats that I want to hear most): early 80's Porsche/Recaro 911 chairs make my right hip go sore after a few hours; the new 335ix's seats treated me horribly on a drive from Philadelphia to St. Louis- I actually preferred the back seat in that car. What a letdown.... In e30 cars, I am comfortable in both the sport seats and in the stock seats. I drive for ten hours in either a 325e/i or an is/es without discomfort. Can anyone relate, and give a guess as to which e36 M3 chair I might be happiest with? I have the Vaders in my M3 coupe and the Luxo seats in the M3 sedan. For a day at the track or the autocross, I definitely prefer the Vaders because of the more prominent bolsters. However, for a 15 hour day behind the wheel (which we've done several times in both cars), the Luxo seats win hands down for me! They are still plenty supportive but are simply more comfortable. That's one of those things that's going to be pretty subjective though, everybody is built different so others may have a different opinion. That's just mine. Let us know what you end up with!! your a big tool eric. I've logged plenty of miles in my old vader seats and so have you, you were probably with me on the road trips. thanks, heller. but im looking for constructive input here. and we put far more miles in on the white e30s than in that e36. sometimes i feel guilty for even considering moving to e36 cars personally. but, as is evidenced by the posts of other members, the e36 is a great car. its just a different machine; differently designed for a different purpose than was the e30. i wish someone would just sell me their lo-mileage e30 325is and I could call it a day... but id see another e36 m3 on the road (happens dozens of times daily) and remember how much fun they are. that is, for a later-model car! still tho... e30 for life. you must not have been with me on that trip. I road tripped the e36 up to 'cuse and all around upstate ny one time. I think I went to see you in colgate too which would explain why you weren't in the car. remember that story about the cop and almost getting picked off doing 130 on I-81? Anyway, those seats are comfy, even after long hours IMHO. Just in case noone mentioned this, but the sedan's chassis is more rigid than the coupe. Less flex is good! BMW used the sedan's instead of the coupes in the world touring car championship. eawright301, i have traveled across country in the luxe seats many times and they are extremely comfy. i autox in them w/ a harness - no issues! and i'm comfy. imo- u can't go wrong w/ an e36 m3- sedan or coupe. i know of someone selling a cosmos black sedan in houston if you are interested. p.s. +1 e30 for life! edit: just noticed the date of the original post. u may already have one!